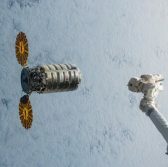 Orbital ATK is scheduled Tuesday to begin the company’s seventh cargo resupply mission that will transport scientific research, supplies and hardware to the International Space Station for NASA. A company-built Cygnus spacecraft, nicknamed S.S. John Glenn, will launch atop United Launch Alliance‘s Atlas V rocket from Cape Canaveral Air Force Station in Florida to deliver more than 7,600 pounds of cargo to ISS, NASA said Wednesday. NASA rescheduled the launch from mid-March to April due to identified booster issues on the launch vehicle and technical issues with ground support equipment. The OA-7 mission is part of Orbital ATK’s Commercial Resupply Services contract with NASA and meant to support Expedition 50 and 51 crew members at the space laboratory. S.S. John Glenn will carry experiments that include an antibody investigation designed to boost the effectiveness of chemotherapy drugs; a plant habitat to study plant physiology in space; and magnetized cells and tools to explore the reproducibility of space experiments, NASA noted. The spacecraft will also transport 38 CubeSats that will be deployed in the next months as part of the QB50 program. Expedition 51 Commander Peggy Whitson of NASA and Flight Engineer Thomas Pesquet of the European Space Agency will use ISS’ Canadarm2 robotic arm to capture Cygnus OA-7. NASA expects the spacecraft to depart ISS in July and subsequently conduct an experiment on how fire burns in space before it re-enters the Earth’s atmosphere.